Walt Disney World—not known for doing things “half way”—takes the everyday, standard dining experience and flips it on its head. From the high-priced, once-in-a-lifetime luxury settings to dynamic, family-friendly atmospheres, there is no shortage of unique ways to cement an amazing culinary memory, providing vacationers the one-of-a-kind, unforgettable experience Disney prides itself on. Here, we offer our top 10 picks for unique Walt Disney World dining experiences. This pick may be up for debate as the food here—while perfectly palatable—is arguably forgettable, but the prehistoric, larger-than-life atmosphere which transports its patrons to a different time and place is certainly not. 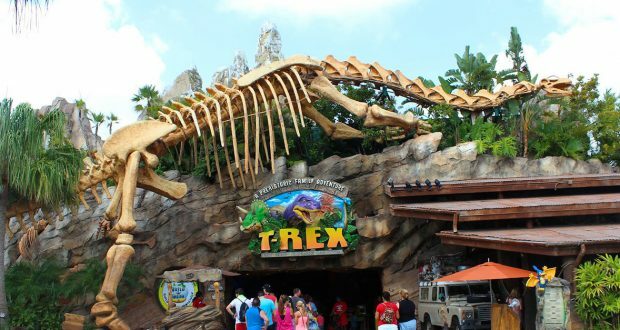 Not unlike the nearby Rainforest Café which surrounds guests with the sights and sounds of the rainforest, this restaurant might place you right next to a snarling animatronic dinosaur or massive undulating octopus while you dine on gargantuan sized plates of food. Every twenty minutes or so, the “meteor shower”—complete with ominous rumbling and fiery “explosions”—is certain to confound your senses into thinking that the end is near for you and your prehistoric neighbor, but not to worry, this restaurant and its distinctive dining experience is nowhere near extinction! This restaurant, featuring vibrant views of the attraction Living with the Land, actually rotates while you dine—not in the carnival-twirl-a-whirl, am-I-going-to-lose-my-lunch kind of way, but in a very slow, you-might-not-even-notice-it if you’re digging into your meal kind of way. The ever-moving revolutions of the restaurant coupled with the Disney character interactions while you scarf down all-you-care-to-eat plates of delicious Harvest-inspired fare (either for breakfast, lunch, or dinner) make this restaurant a no-brainer when looking for unique dining experiences. And bonus, many of their veggies are grown right there in the Living with the Land greenhouses! If sharing a table and a meal with a one of the creative geniuses that helps make Disney, well, DISNEY isn’t one of the most unforgettably unique culinary ventures on Disney property, then I’m Rafiki’s uncle. The fact that Disney provides guests with an opportunity to pick an Imagineer’s brain while they eat proves that Disney is all about taking the guest experience to an entirely new level, where every day Disney goers can actually rub shoulders with the endlessly creative likes of an Imagineer, gaining unique insights into the process of what it takes to build, reinvent, and dream up Disney magic. Guests can choose between two signature dining spots on property—Citricos or The Brown Derby—which are both great places to dine even without an Imagineer sharing your bread service. Getting into this super popular Hollywood Studios table-service restaurant without a reservation is like winning free Disney tickets on Facebook—sure, it COULD happen, but I wouldn’t place any bets on it. The reason so many people love this unique dining destination is for the ultra-creative theming. When one walks into the dining room, they immediately feel as if they are walking under the stars amidst an old school drive-in theater circa 1950s, equipped with classic convertible cars (these are your dining tables!) and a giant screen playing black-and-white sci-fi and horror movie trailers (don’t worry, the scariest it gets is “The Swamp Thing”). The food is typical American diner food (i.e. milkshakes, burgers, etc.) with a few unique additions (i.e. S’more milkshakes, salmon burgers, etc). Will it be the best burger you’ve ever sunk your teeth into? Probably not, but you are here for the experience, which definitely amps up the menu in our opinion. It’s hard not to immediately fall in love with this Irish pub themed restaurant, equipped with live Irish bands, Irish step dancers (think Riverdance), and a menu full of authentic Irish comfort foods. The atmosphere is lively and celebratory, engaging patrons from the moment they walk-in. Irish dancers routinely take the stage and elevated platforms to perform captivating dances, even inviting children onto the stage to perform from time to time. Don’t worry if you are seated in one of the side rooms, the dancers will make their way to perform in there too! The live band is also a huge hit with guests while they nosh on bangers and mash and soda bread and sip Guinness. Unlike some of the other places that have made our list, the food here is consistently delicious and if you have room for it, be sure to try the Bread and Butter Pudding at the end of your meal. One whiff and taste of this superb, legendary dessert and your willpower will vanish into the jubilantly raucous air around you. Yes, the hype is real. Sanaa is a guest favorite dining destination, not only for the panoramic views of exotic wildlife roaming just outside the windows, but also for the African-inspired cuisine, exploding with flavors that are more enticing than intimidating, even for the pickiest of palates. Where else can you gaze upon zebras, giraffes, gazelles and ostriches (among many others animals) while feasting on moan-inducing dishes (yes, the food is THAT good!). Make sure you order the Indian-style bread service featuring soft and chewy Naan bread with 9 different accompaniments (from sweet mango chutney to spicy jalapeno-lime pickle). You won’t be able to stop thinking about this dish for years to come, trust us! Very few dining establishments can elicit the smiles and laughter that this place guarantees. It’s one of the three dinner shows that Walt Disney World offers and our favorite pick! This place is like a western saloon featuring a troupe of six Wild West performers who take the stage while you dine to make you laugh at their vaudeville slap-stick humor and clap along as they dance and sing. Rib-sticking comfort foods helps make this place a winner. You’ll get plate after plate of fried chicken, smoked BBQ pork ribs, baked beans, cornbread, and lip-smackingly delicious strawberry shortcake. Guests consistently proclaim this dinner show as the highlight of their vacation as it is packed-full of family-friendly fun. As one of the only dining locations that truly transports its’ guests into the wonder of a classic Disney film, Be Our Guest has drawn quite the attention since it first opened in 2012. Everything about this restaurant is unique, from the atmosphere (dining in one of three rooms inside the Beast’s castle), to the food (try The Grey Stuff, it’s delicious! ), to the high-tech check-in, food ordering, and food delivery service (for breakfast and lunch). For dinner, this is a table-service setting, and is even more enchanting because you’ll get to greet The Beast himself after you dine. Everyone has their own opinion on which room to dine inside, but the details of each room are not to be missed regardless of where you eat your meal. Feel free to roam the “castle” and delight in the special magical touches like snow falling outside the “windows,” the glorious chandeliers hanging above that look identical to those in the film, and the Beast’s portrait transforming into a ruined image with his unmistakable claw marks. This is an unforgettable dining experience fit for a beauty or a beast, and everyone in between! Perhaps it’s because of the enormous sticker shock one might get at seeing the prix-fixe menu prices at this prestigious AAA Five Diamond award-winning restaurant that makes this an experience for the few and not the many, but it’s definitely a unique dining experience worth mentioning. Let’s face it, this is probably one of the most—if not THE MOST—expensive dining experiences you’ll ever have, especially if you opt to dine at “The Chef’s Table” instead of the main dining room, so the food has got to be good, right? You bet your bottom dollar it is. In fact, most people boast that the foods here are the best they’ve ever—yes, EVER—tasted. As the ultimate fine-dining experience at Walt Disney World, guests can expect to adhere to a strict dress code, but stepping foot inside the grand dining room confirms why—this place is the epitome of luxury, every detail from the table linens to the fresh cut flowers, from the exemplary service to the exquisite personalized 3-hour dining experience, is catered to not only please each guest, but to make a lifelong impression and memory they’ll cherish. When you have to dial a special number and work one-on-one with a Disney dining specialist to orchestrate your private dining experience, you know it’s going to be one for the books! There are SO MANY places on Disney property where you can arrange to eat a special meal with a personalized menu catered to your every whim, places many people would never imagine. Need an example? How about a dinner party on the upper-floor terrace of the Tower of Terror attraction at Disney’s Hollywood Studios (no, I’m NOT kidding!). You can eat a private dinner onboard a specialty yacht while watching a Disney fireworks show. You can even arrange a special meal with a personal butler on a private Grand Floridian balcony facing Cinderella Castle. These private events are customizable and are as unique as they get at Walt Disney World! If you’d like more information on Private Dining at the Grand Floridian call 407-824-2474. For an event anywhere else on Disney property, dial 321-939-7278. For more recommendations on Walt Disney World Restaurants that did not make our cut but are still definitely worth experiencing, try out 50’s Prime Time Café at Hollywood Studios, Ohanas’ at Disney’s Polynesian Resort, Afternoon Tea at the Garden View Tea Room at Disney’s Grand Floridian Resort, California Grill at Disney’s Contemporary Resort, and Cinderella’s Royal Table at Magic Kingdom!